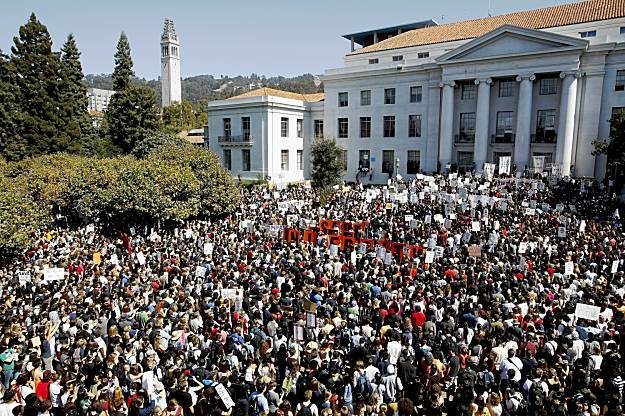 5,000 rallied at Sproul Hall today at UC Berkeley, Sept. 24, 2009. Editor: While students and UCSD faculty and employees stage a one-day strike up at the La Jolla campus, other UC campuses also joined in the state-wide protest. Here is a report from Berkeley. BERKELEY — Thousands of UC students marched through downtown Berkeley and the area around campus this afternoon, staging a sit-down protest and blocking traffic as part of a demonstration against cuts to the university budget and proposed fee increases. The unscheduled march started at the end of a two-hour rally on Sproul Plaza attended by an estimated 5,000 students, professors and other university employees. The protesters, shoulder to shoulder and chanting “Education should be free. No cuts, no fees,” marched through campus, passing by UC Chancellor Robert Birgeneau’s office, and then went off campus to Shattuck Avenue, ultimately blocking all lanes of traffic for two blocks. Turning up Bancroft Avenue, they marched to Telegraph Avenue, where they staged a sit-in at the entrance to the campus. By 3:30 p.m., the crowd had thinned to a few hundred. Looks a lot more fun than a freakin’ tea party. aaah, the good old days at berkeley. the smell of tear gas, selling the Berkeley Tribe on Telegraph Ave, crashing on the floor, dysentery, free food…dem was de daze…. this is awesome! i can see mario savio’s ghost right there on that cop’s car. What completely flummoxes me is that John Yoo is a professor there, and UC Berkeley seems just fine with that. The school may be okay with it, but students have been protesting his presence on campus. But maybe like you think, I feel John Yoo should be prosecuted for breaking the law, not paid to teach it. I generally don’t break laws. :) I just bend them sometimes. And god forbid, I don’t get paid for teaching (law)! big ooops bill, sorry about that. I will use my edit button for the first time. (pause) There, that’s better.